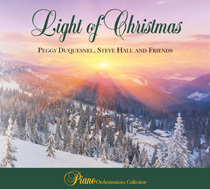 The "Light of Christmas" piano orchestrations album combines 18 tracks and 62 minutes of instrumental holiday music with solo piano, small ensembles and a full orchestra featuring the artistry of Peggy Duquesnel, Steve Hall and friends. 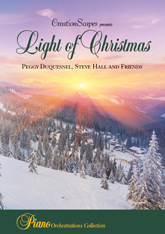 This inspiring and timeless collection of traditional Christmas carols also includes three popular holiday originals by Peggy Duquesnel... "Christmas is Here," "Under the Christmas Tree" and "Light of Christmas!" May the music on this special collection bring joy, peace and light to your holidays!